CHARLOTTE HARBOR & THE GULF ISLANDS, Fla. (May 13, 2016) – Yesterday, Capt. Ralph Allen, owner and operator of King Fisher Fleet in Punta Gorda, Fla., was inducted into the Charlotte County Tourism Hall of Fame during the Tourism Luncheon at the Charlotte Harbor Event & Conference Center. The Hall of Fame was established in 2014 to honor those who have had a substantial and long-standing body of work that has positively impacted tourism in Charlotte County. King Fisher Fleet was founded in the early 1980s by Capt. Ralph’s parents, Capt. Bob and Helen Allen. In 1985, Capt. Ralph acquired his Captain’s license and began working full-time for the family business. From home port of Fishermen’s Village, King Fisher Fleet has grown into a Southwest Florida institution over the last 30 years. The marine operation offers multiple sightseeing cruises and fishing charters on Charlotte Harbor, Gulf of Mexico and Peace River which are enjoyed by thousands of guests every month. King Fisher Fleet has received numerous awards and accolades over the years including being voted “Best Charter Boats In Charlotte County” in the Charlotte Sun-Herald’s readers’ poll every year since the poll’s inception in 1996 and King Fisher Fleet’s fishing charters have been awarded four IGFA world records and the subject of many newspaper and magazine articles and numerous television shows. King Fisher Fleet supports dozens of Southwest Florida charities and non-profits in their fundraising effort and Capt. Ralph takes pride in his own personal community service. He’s a member of the Gulf of Mexico Fishery Management Council’s reef fish advisory panel, the Charlotte County Marine Advisory Committee, the Florida Sea Grant Charlotte Harbor advisory committee, is on the Board of Directors of the Charlotte Harbor Reef Association, is on the Board of the Charlotte Harbor Environmental Center and is a Director Emeritus of the Charlotte County chapter of the Coastal Conservation Association. He served on the Charlotte County Tourist Development Council from 2001 to 2014 and in 2013, was awarded the prestigious Pacesetter award by the Charlotte County Chamber of Commerce in 2013. Capt. Ralph enjoys sharing his experiences on the waters of Southwest Florida through his writing. 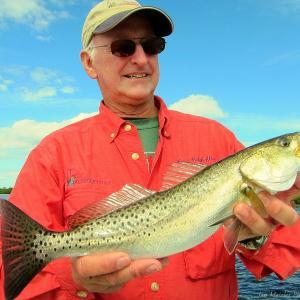 He has written an outdoor column for the Charlotte Sun-Herald for over 30 years, and is the Southwest regional field editor of Florida Sportsman Magazine. He’s received numerous writing and photography awards from the Florida Outdoor Writer’s Association, of which he is an active member and a past-president. He is author of the University of Florida book “A Tackle Box Guide to Fishes of Southwest Florida”. Previous inductees are Becky Bovell, former director of the Charlotte Harbor Visitor & Convention Bureau, and Capt. Marian Schneider, an ecotourism pioneer who operated Grande Tours in Placida for more than 25 years. The Charlotte County Tourism Hall of Fame is located in the Charlotte County Administration Building at 18500 Murdock Circle, Port Charlotte. The Tourism Lunch’s theme focused on culinary tourism and was hosted by the Charlotte Harbor Visitor & Convention Bureau at the Charlotte Harbor Event & Conference Center. Prior to a delicious buffet lunch prepared by SAVOR, the in-house caterer for the Charlotte Harbor & Event Center, several Charlotte County restaurants offered samples from their menus to members of the local tourism and business community in attendance. Participating restaurants were Farlow’s On The Water, Hurricane Charley’s Raw Bar & Grill, Peace River Seafood, Rum Bay Restaurant at Palm Island Resort and Village Fish Market. Emily Ellyn, known as the Retro Rad Chef from Food Network, was the lunch’s keynote speaker and celebrated Charlotte Harbor & the Gulf Island’s culinary scene. Radio personality Chris Kelly served as the lunch’s emcee. Each year, the Charlotte Harbor Visitor & Convention Bureau conducts marketing, sales and promotional campaigns to increase awareness of and visitation to Charlotte County. In addition to generating economic contributions, the Charlotte Harbor Visitor & Convention Bureau is also focused on developing soft adventure or eco-tourism, a low-impact industry enabling the county to preserve the invaluable natural resources that contribute to its ecological health, distinguish the area and draw visitors. During calendar year 2015, Charlotte County welcomed an estimated 395,800 visitors and tourism generated an estimated $345,067,400 in direct expenditures and made an estimated $526 million economic impact in Charlotte County.